"Starting with Toy Story in 1995, Pixar have gone on to create 13 feature films, all of which are in the 50 highest-grossing animated films of all time, and have picked up 11 Academy Awards along the way. 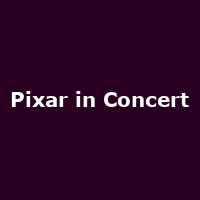 Pixar in Concert celebrates these achievements as some of the most visually stunning clips from films such as the Toy Story trilogy, Cars, Finding Nemo, Wall-E and Up are shown in high-definition on the big screen whilst the memorable scores are performed live and in sync by the Royal Philharmonic Concert Orchestra. A treat for audiences of all ages, this concert presents the collaborative relationship between music and storytelling in animation and how these stirring scores contribute to the stories unfolding on screen."